In the past year, our Prison Yoga Project program has realized a lot of dreams. From the launch of our first Yoga Alliance-recognized Teacher Certification Training for 16 prisoners at the Maryland Correctional Institute for Women (MCIW), to a new 16-week fee-for-service yoga and mindfulness pilot program at CDCR’s Youth Correctional Facility in Stockton, CA, we are making strides in sharing the transformational tool of yoga with men and women behind bars. Now, we hope to realize one more dream: to create a teacher portal on the Prison Yoga Project website. The portal will function as a place where teachers trained through Prison Yoga Project can make and renew friendships, trade experiences, discover new opportunities, collaborate on projects, organize get-togethers…whatever you can imagine. The portal will be open to all yogis who are interested in karma yoga, offering an opportunity to engage and learn more. The teacher portal will amplify the powerful potential of our community, so we can better support men and women behind bars. 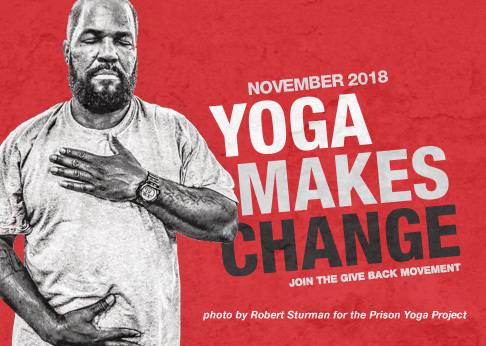 Prisons nationwide are starting to recognize the value of yoga to provide strategies for non-violent problem resolution, a renewed sense of self-worth, and skills for building a better life. Wardens are asking for trained teachers to come into their facilities – and through the portal, we can be much more effective in making this happen. We are now within reach of this dream becoming a reality. Recognizing that a teacher’s portal is crucial to help Prison Yoga Project meet present and future demand for yoga programming in prisons, the Kalliopeia Foundation has pledged up to $5,000 in matching funds to help launch this project. Will you light the match, and help us illuminate the life of men and women behind bars by making a donation today? Together, we can make a bigger impact for those we serve. Give now and multiply your impact. The motivation to serve is an extension of gratitude for my teachers and the desire to help others experience similar benefits. In the context of teaching, not a class goes by that I’m not learning/ growing. If I’m saying it aloud to anyone, it is still for me to hear. Students show up in very earnestly (especially those in prison), and with a courage that is admirable. At the end of class I take inventory of what was said and this becomes my ‘to do’ list. Needless to say, the list is always meaningful. In a trauma-informed yoga setting, using language that invites participation, and giving students a choice on how they would like to participate, are essential to facilitating a therapeutic experience. Nothing is assumed — the class is on their terms. The environments are not always conducive to relaxation. Modeling equanimity in often-uncontrollable circumstances becomes the main tool for guiding students towards a relaxed and peaceful state. The greatest challenge in all teaching experiences, I believe, is for the teacher to motivate the student to learn, and to assure the student that all efforts represent progress; and to make every effort to adapt to the students’ learning styles. Using mindfulness to remain free of trigger references and leveraging Marshall Rosenberg’s Non-Violent Communication protocols have been invaluable tools. My advice is that they go forth with enthusiasm to help those whom society so often deems unworthy of such assistance. The safety and success of the students is priority number one, so the flexibility and equanimity of the teacher is of prime importance in the often-complex circumstances within a prison. Anyone who is going to teach would do well to become informed of the psychological underpinnings of PTSD, and to become acquainted with communication approaches such as Marshall Rosenberg’s Non-Violent Communication method. Trust in your volition to serve — be authentic. If you’re true to your practices and commitment, your presence will speak volumes to the populations you serve. They’ll know you are there to help them the minute you walk into the room. I hope that yoga service as a separate and distinct practice becomes our collective social way of being — how we treat one another — under all circumstances. This means treating others with compassion, understanding, respect, love, and dignity. I hope that that future generations are taught from the start how to live well in a human body, cultivate a focused and discerning mind. And a compassionate heart. Are you interested in sharing trauma-informed practices with at-risk populations? Join an upcoming Prison Yoga Project training to learn how you can effectively share tools for transformation. This past Friday night, 18 women and one life-sized plastic skeleton gathered in a small classroom at Maryland Correctional Institution for Women. Excitement was high, and the energy was focused. After completing a six-month preparation intensive, 16 prisoners were about to begin an RYT200 yoga teacher training. Over the next 11 months, these women will join two teachers from the Prison Yoga Project to delve into the study of Anatomy and Physiology, Sanskrit, Yoga History and Philosophy, Postures, Teaching Methodology, and Ethics and Yogic Lifestyle. At the end of their program, they will graduate as yoga teachers and will be eligible to register with Yoga Alliance at the RYT200 level, a qualification that will allow them to teach behind bars and in the free world. Laughter, anxiety, confusion and understanding wove together as the women explored the structure of fundamental poses, took turns practicing and teaching, meditated, read, and stumbled over the meaning of words in an unfamiliar language. Coming from a broad variety of backgrounds and covering a wide age span, the women drew together to support one another. At the end of the evening on Sunday, after 16 hours of training, the group sat together for one final guided meditation. Tired and happy, loaded down with homework and practice guidelines for the following month, they returned to the routine of their daily lives, the seeds of learning already emerging. Will there be struggles along the way? Certainly. The path towards becoming a teacher is never easy, and life in prison is not designed to be smooth. But the bonds of yoga have been established, and they are powerful. Your support can help us to complete this training, and to seed a scholarship fund that will educate more women behind bars. Learn more and donate today. This is an interview with Elizabeth Carling, who offers a free community-based yoga program with the support of her employer, Patricia McKeen, owner of A New Awakening counseling agency in Albuquerque, New Mexico. Elizabeth started a free class at A New Awakening as a way to offer the mindfulness-based tools of yoga to clients who struggle with the challenges of addiction, mental health imbalances, domestic violence, and reintegration following incarceration. Rob: What originally motivated you to bring yoga to the New Mexico prison? We say we want things to change in our society, but if we don’t offer inmates any tools for change we are setting them (and us) up for failure. I would say that recidivism rates are a reflection of that old definition of insanity: “to keep doing the same thing over and over and expect different results.” I also feel that mindfulness programs would aid in reducing medication costs for prisoners, and would save the system money. This is yet to be researched, but is certainly an area worthy of investigation. Last but not least, we have heard from corrections staff that prisoners who participate regularly in the yoga group are more cooperative and exhibit fewer behavioral issues, making staff’s job easier and more effective. What is the greatest obstacle in mindfulness classes becoming a regular feature of prisons? The greatest obstacle in mindfulness-based programing becoming commonplace in prison curriculum is the perception that it is non-pragmatic because it does not fit the model of education that administration is familiar with. Certainly a GED, or learning automotive skills, are practical investments; but if we don’t help inmates to address cognitive distortions, limiting patterns of behaviors, complex trauma, and often a history of addiction, then they are not going to function optimally upon release, let alone be contributing, successful members of society. What is not fully understood by the prison system is that yoga and mindfulness techniques are a form of somatic therapy that aid in improving and restoring the body-mind connection so that a person can contact inner resources to self-regulate and enhance well being. Inmates who are taught how to become sensitive to the self through present-moment awareness will recognize the pain and suffering they cause themselves and others as a result of their own maladaptive behavior. Offering mindfulness education is not frivolous; it gives inmates the opportunity to expand their capacity for compassion, and make conscious choices that result in pro-social change. What advice would you give anyone who would like to volunteer teaching a weekly class at a prison? The best advice I can offer is to cultivate a unified approach to all that transpires inside the gates. I’m often reminded of the value of the yogic philosophy of “samatavam,” or “sameness,” and the benefit of sitting in the middle and serving, seeing, and acting from a place of oneness. I also wholeheartedly agree with James Fox’s suggestion to co-teach the class, rather than go it alone. Since day one I have been fully supported by my dear yogi friend and colleague Patricia McKeen, who is invaluable in holding a safe space for teaching to unfold. We can also affirm the importance of consistency in working with this population. Showing up at the same time, week in and week out, builds trust and positive regard. I’ve also found that the PYP model of sandwiching asanas between a beginning and an ending centering technique to be a necessity in encouraging inmates to be fully present and grounded while practicing in a turbulent environment. What should prison administrators know about the Prison Yoga Project? They should know that PYP instructors offering yoga classes are fully aligned with respecting and abiding by the correctional facility’s rules and regulations. We are aware of the effort prison officials and staff put forth to ensure our safety, and are more than willing to cooperate with anything that makes their job easier. PYP instructors are also open to designing classes for special populations such as vets, mental health inmates, or using body-centered skills for conflict resolution. Originally published on the Huffington Post Blog on November 24, 2015. Are you interested in helping to empower incarcerated women? Learn how you can support a historic yoga teacher training that will take place behind bars by donating to the Prison Yoga Project’s Women Prisoners Scholarship Fund. Rob: What originally motivated you to bring yoga into federal prisons in Ontario? Living in Kingston, Ontario, where we have six federal prisons, we are constantly aware of our incarcerated population. My husband works as a parole officer in The Correctional Services of Canada. As such, he works directly with this population in all security levels at various stages of their rehabilitation. The one common theme that continues to appear in his efforts to help develop rehabilitative plans, is that regardless of education, career training, and behavioral programming, if a person is fundamentally unable to deal with stressful situations, be self-reflective, and connect with their own ability to change, he or she will not change. The great majority of our federal inmates have suffered abuse at some level, and healing the spirit does not come through vocational training, increased education, or even psychological and psychiatric counseling alone. This healing begins by looking within. When an inmate is released into our communities we want for them to be healthier people, in body, mind, and spirit. To return our inmates into society with tools that allow them to successfully manage the challenges they face reintegrating into society is a gift that all of society benefits from. Knowing that yoga and meditation enable this type of fundamental healing and change, my husband and I have been committed to bringing these practices into our correctional facilities for over 20 years. Life inside a prison is not conducive to self-reflection, developing kindness, compassion, patience, or self-awareness. There is constant fear, noise, and chaos. Life in prison, especially in the higher-security institutions, is more about survival than healing or learning. Healing requires a slowing-down, learning requires a calm mind. Tending to our inner world to create these states of calm and quiet inner reflection is a necessary step in learning that, when we react, we make a choice. Recognizing we can choose to act differently implies that we know what we are doing. This level of self-awareness is a challenge for every one of us; couple that with the extremely chaotic conditions of life in prison, and you have a recipe for failure. Teaching techniques to develop self-awareness, and providing tools for learning how to overcome self-limiting impulsive behavior, enable change. Everyone can benefit from the practices of yoga and meditation; yoga is not an exercise system for the body alone. Practicing yoga and meditation develops the mind. It enhances concentration, mental focus, and awareness, thereby reducing physical, mental, and emotional stress. When we learn that we have the ability to stay calm, and know how to do so in the middle of chaos, impulsive reactivity becomes thoughtful response. When these practices are made available under the guidance of an appropriately trained teacher on a regular basis, a student can learn how and what to practice in the way that is suitable and beneficial for her or him. Not all yoga practices and disciplines are appropriate for all people. A consistent and patient practice of yoga requires the guidance of a teacher who has the knowledge to recommend practices suitable for the individual. If our incarcerated population is to learn how to live inside and outside of prison in a way that enables growth and development, we need to provide quality and consistent programming that is appropriate to its needs. The cost of bringing these programs into prisons is inexpensive compared to the costs we are all paying now for the incarcerated population. It is critical that we as a society demand that yoga and mindfulness programs be offered as a core component of rehabilitative correctional plans. Investment in such programs will enable consistent availability and quality of programs delivered by instructors dedicated and committed to do this specialized work, to meet the needs of this population, for the long term. Has the application and effectiveness of your program been evaluated? Is there an evidence base in particular? There is ample research, from all over the world, that indicates the positive affect of yoga and meditation on stress reduction and related issues. The International Association of Yoga Therapists (IAYT) has just celebrated its 25th anniversary, and is a leader in research into the therapeutic benefits of yoga. To this date, there are no known evidence-based Canadian research findings indicating the benefits of yoga and meditation for our incarcerated population, but similar studies have been done in other countries, and can be found through the IAYT. On a personal note, the anecdotal evidence, which is plentiful, is what inspires me to keep sharing my knowledge, time, and efforts with this group of students. In my years of teaching there have been many conversations with chaplains, parole officers, and inmates themselves attesting to the benefits of yoga and meditation practice. It has often been said that the men are so much more relaxed, less argumentative, less angry, and able to sleep better. One student who attended at least five of the eight-week sessions also developed a daily practice in his cell. He knew that yoga and meditation was helping to change his inner life, which would enable him to change how he integrated back into the community outside of prison. What is the greatest challenge in mindfulness classes becoming a regular feature of prisons? The greatest challenge to providing quality learning experiences is consistency in programming. Consistency in teaching, as well as finding teachers with the level of experience and willingness to share with this community, is not an easy thing to pull together. If the programs could be offered as a part of CSC core programming — in other words, available during the day and not considered extra-curricular — it may be easier to recruit teachers who are usually teaching in the evenings and on weekends. What advice would you give to anyone who would like to volunteer teaching a weekly class at a prison? My advice is in the form of benefits of this work that I experience, in the hope that others will take up the work: the rewards I experience by serving this population are beyond description. From my perspective this is a safe environment whose participants are among the most grateful, enthusiastic, and eager students I have ever taught. When a student says to me “this is the best part of my week, I look forward to being here so much, it helps me more than anything else that I do,” I am humbled, my heart expands, and I know I am making a difference. What should prison administrators know about your yoga programs? Administrators and policy makers need to know that this program teaches the whole person, from within, a new way of being in the world, which extends to how they interact in the world and with themselves. Once they understand this, perhaps yoga and meditation will become an integral part of a holistic rehabilitative correctional intervention. I strongly believe that yoga and meditation can produce reduced recidivism rates, and increased success of reintegration. When the full range and value of the effectiveness of these practices are understood then the relatively inexpensive costs associated with providing them, not merely as an extra-curricular activity, but as a core component of a rehabilitative correctional plan, could be considered as a positive cost that benefits all of society. Help Give Back Yoga to put yoga and mindfulness guides in the hands of 1,000 prisoners this year by purchasing Prison Yoga Project’s powerful books, A Path for Healing and Recovery and A Woman’s Practice: Healing from the Heart. For every purchase, we can fund the printing of additional books that will be made available at no cost to men and women behind bars.